September donations and thank you to the Python Software Foundation! We would like to show you a short update on the PyPy funding. We gathered a total of $15,986 in the month of September and as per earlier agreement, the Python Software Foundation donated $10,000 to PyPy. We would like to thank everyone participating and the PSF in particular for supporting the PyPy project and making our work possible! We've been working hard on the goals outlined in the funding proposals. PyPy Python 3 support has been in beta for a while and it's already being used by many people, as seen per the number of reported bugs. We're currently supporting 3.2, planning on moving towards 3.4 in the future. Software Transactional Memory has been a successful research project, with first real world results shown during the Warsaw sprint. More detailed update on numpy will be published soon. A little spoiler is that we're planning on addressing matplotlib, scipy and the larger ecosystem to some extent. Stay tuned! Again, thanks to everyone who donated and happy Thanksgiving to everyone on that side of the world! 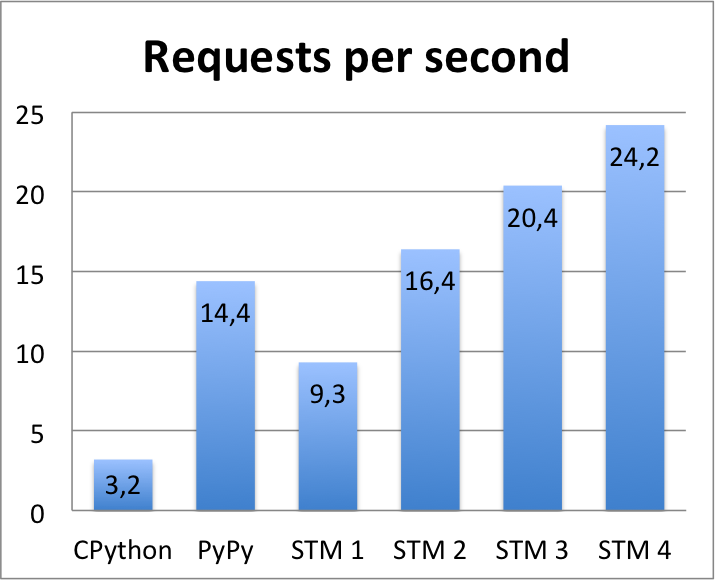 This post is by Konstantin Lopuhin, who tried PyPy STM during the Warsaw sprint. Python has a GIL, right? Not quite - PyPy STM is a python implementation without a GIL, so it can scale CPU-bound work to several cores. PyPy STM is developed by Armin Rigo and Remi Meier, and supported by community donations. You can read more about it in the docs. The actual commit is here, - we had to extract a little function to run the callback. There are only three kinds of conflicts, they are described in stm source, Here we see that two threads call into external function to get current time, and we can not rollback any of them, so one of them must wait till the other transaction finishes. For now we can hack around this by disabling this timing - this is only needed for internal profiling in tornado. 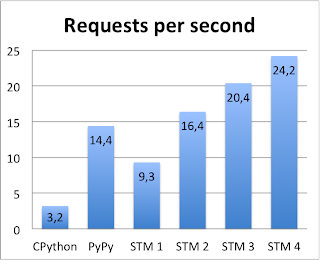 As we can see, in this benchmark PyPy STM using just two cores can beat regular PyPy! This is not linear scaling, there are still conflicts left, and this is a very simple example but still, it works! First, these are best-case numbers after long (much longer than for regular PyPy) warmup. Second, it can sometimes crash (although removing old pyc files fixes it). Third, benchmark meta-parameters are also tuned. Here we get relatively good results only when there are a lot of concurrent clients - as a results, a lot of requests pile up, the server is not keeping with the load, and transaction module is busy with work running this piled up requests. If we decrease the number of concurrent clients, results get slightly worse. Another thing we can tune is how heavy is each request - again, if we ask primes up to a lower number, then less time is spent doing calculations, more time is spent in tornado, and results get much worse. The first one is presumably calling into some C function from stdlib, and we get the same conflict as for time.time() above, but is can be fixed on PyPy side, as we can be sure that computing sha1 is pure. Comment by Armin: This is a conflict in the transaction module itself; ideally, it shouldn't have any, but in order to do that we might need a little bit of support from RPython or C code. So this is pending improvement. Tornado modification used in this blog post is based on 3.2.dev2. As of now, the latest version is 4.0.2, and if we apply the same changes to this version, then we no longer get any scaling on this benchmark, and there are no conflicts that take any substantial time. Comment by Armin: There are two possible reactions to a conflict. We can either abort one of the two threads, or (depending on the circumstances) just pause the current thread until the other one commits, after which the thread will likely be able to continue. The tool ``print_stm_log.py`` did not report conflicts that cause pauses. It has been fixed very recently. Chances are that on this test it would report long pauses and point to locations that cause them. Although we have seen that PyPy STM is not all moonlight and roses, it is interesting to see how it works on a more realistic application. astar.py is a simple game where several players move on a map (represented as a list of lists of integers), build and destroy walls, and ask server to give them shortest paths between two points using A-star search, adopted from ActiveState recipie. The benchmark bench_astar.py is simulating players, and tries to put the main load on A-star search, but also does some wall building and destruction. There are no locks around map modifications, as normal tornado is executing all callbacks serially, and we can keep this guaranty with atomic blocks of PyPy STM. This is also an example of a program that is not trivial to scale to multiple cores with separate processes (assuming more interesting shared state and logic). Although it is definitely not ready for production use, you can already try to run things, report bugs, and see what is missing in user-facing tools and libraries. We've wrapped up the Warsaw sprint, so I would like to describe some branches which have been recently merged and which improved the I/O and the GC: gc_no_cleanup_nursery and gc-incminimark-pinning. The first branch was started by Wenzhu Man for her Google Summer of Code and finished by Maciej Fijałkowski and Armin Rigo. The PyPy GC works by allocating new objects in the young object area (the nursery), simply by incrementing a pointer. After each minor collection, the nursery has to be cleaned up. For simplicity, the GC used to do it by zeroing the whole nursery. This approach has bad effects on the cache, since you zero a large piece of memory at once and do unnecessary work for things that don't require zeroing like large strings. We mitigated the first problem somewhat with incremental nursery zeroing, but this branch removes the zeroing completely, thus improving the string handling and recursive code (since jitframes don't requires zeroed memory either). I measured the effect on two examples: a recursive implementation of fibonacci and gcbench, to measure GC performance. The second branch was done by Gregor Wegberg for his master thesis and finished by Maciej Fijałkowski and Armin Rigo. Because of the way it works, the PyPy GC from time to time moves the objects in memory, meaning that their address can change. Therefore, if you want to pass pointers to some external C function (for example, write(2) or read(2)), you need to ensure that the objects they are pointing to will not be moved by the GC (e.g. when running a different thread). PyPy up to 2.4 solves the problem by copying the data into or from a non-movable buffer, which is obviously inefficient. The branch introduce the concept of "pinning", which allows us to inform the GC that it is not allowed to move a certain object for a short period of time. This introduces a bit of extra complexity in the garbage collector, but improves the I/O performance quite drastically, because we no longer need the extra copy to and from the non-movable buffers. In this benchmark, which does I/O in a loop, we either write a number of bytes from a freshly allocated string into /dev/null or read a number of bytes from /dev/full. I'm showing the results for PyPy 2.4, PyPy with non-zero-nursery and PyPy with non-zero-nursery and object pinning. Those are wall times for cases using os.read/os.write and file.read/file.write, normalized against CPython 2.7. Benchmarks were done using PyPy 2.4 and revisions 85646d1d07fb for non-zero-nursery and 3d8fe96dc4d9 for non-zero-nursery and pinning. The benchmarks were run once, since the standard deviation was small. What we can see is that os.read and os.write both improved greatly and outperforms CPython now for each combination. file operations are a little more tricky, and while those branches improved the situation a bit, the improvement is not as drastic as in os versions. 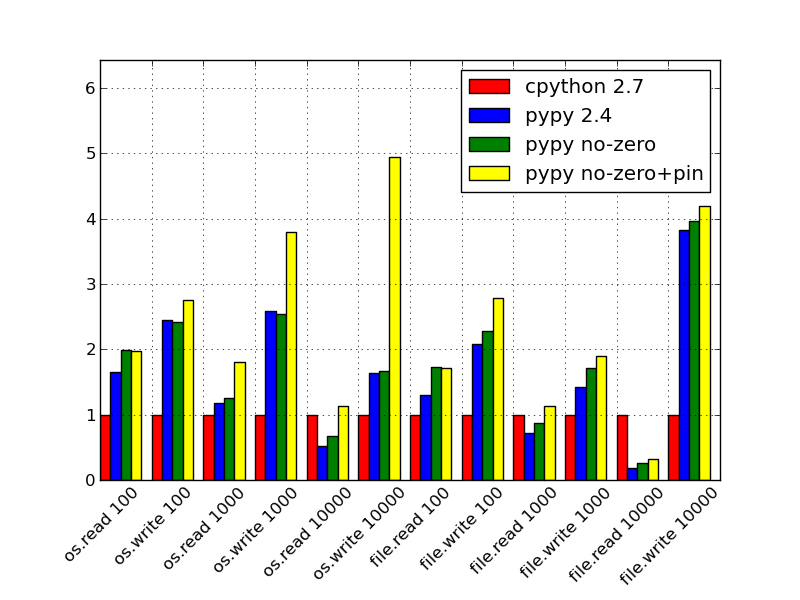 It really should not be the case and it showcases how our file buffering is inferior to CPython. We plan on removing our own buffering and using FILE* in C in the near future, so we should outperform CPython on those too (since our allocations are cheaper). If you look carefully in the benchmark, the write function is copied three times. This hack is intended to avoid JIT overspecializing the assembler code, which happens because the buffering code was written way before the JIT was done. In fact, our buffering is hilariously bad, but if stars align correctly it can be JIT-compiled to something that's not half bad. Try removing the hack and seeing how the performance of the last benchmark drops :-) Again, this hack should be absolutely unnecessary once we remove our own buffering, stay tuned for more.